I am writing to you from a tiny village named Guodong, in the Minqin County of Gansu Province in Northwest China. This is the first stop of my four-month Silk Road trip. 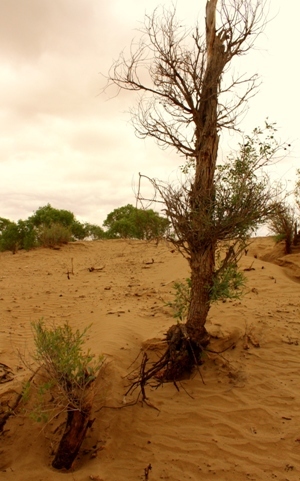 The Minqin County of China is battling against desertification. Like most parts in Minqin County – a shrinking oasis sandwiched by two advancing deserts – Guodong Village is dry and sandy. On a windy day, which most days are, sands would sweep in from the nearby Tengger Desert, coating everything with dust. And if what the locals called “black wind” hit the County, the ferocity of the wind would trigger massive sandstorm, reducing visibility to zero, turning daylight to darkness, and destroying crops and homes. Such a storm had wrecked havoc in the County just a month before I arrived. The villagers are puzzled by my choice of travel destination. To them, to say that I am here for a leisure trip would sound like a mockery. Am I here to enjoy the regular dust storm? Or am I here to taste the bitter underground water due to over exploitation of aquifers? Or am I here to admire the sight of a village being swallowed up by the desert?